Welcome to Utsch's Marina on the Cape May Harbor! Located at the east end of the Cape May Canal, this full-service facility can provide you with dockage for overnight or for the season. Our factory-trained mechanics can keep your vessel in top running order, and get it ready for winter storage. Check out the links listed below for the many other services Utsch's Marina can provide. Our family-owned and operated facility was founded 60 years ago by Ernest Utsch, Sr. and Ernest Utsch, Jr. . . . . It is still being operated by his sons Ernest Utsch, III and Charles P. Utsch. Boat Sales: Looking for a new vessel, or a place to sell your old one? Contact us: utschyachtsales@comcast.net. Check here for our current listings. Yard Sale: Don't miss this annual event where you can sell your excess fishing and boating paraphernalia or pick up some great bargains. See you next September! Charter & Party Boats: Want to take a fishing trip, but don't own a boat? Maybe a day parasailing is more your style? Check out the charter and party boats that call Utsch's Marina their home. On-Site Attractions: Need some activities for your day at the shore? These experienced Captains can take you for a leisurely ocean tour or adrenaline-pumping ride. Bath House : After years of waiting, the Gertrude M. Wagner Building was opened on June 14th, 2002. Check out our private showers, Internet Lounge and laundromat. Fuel: We're the answer to your gas and diesel fuel needs.. Tackle Shop... and more! Need something for breakfast before that fishing trip? Maybe a cold iced-tea or ice cream to end the day, or hot coffee to get you started. 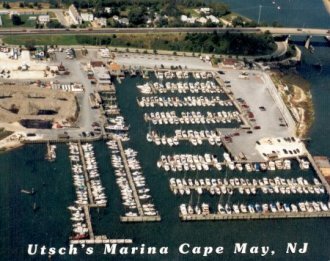 Cape May Calling: Read what Chesapeake Bay Magazine had to say about Utsch's Marina and Cape May in their January, 2000 edition. Waterway Guide Readers' Choice: The readers of Northern Waterway Guide love Utsch's Marina! In fact, we're the only Cape May County marina listed in their column "Readers' Top 10 Marinas". Check it out! Area Attractions:Schellenger's Landing, Cold Spring and Cape May are filled with great things to do and see. Transportation: We'll tell you where to go. . . and how to get there! Marina Pictures: A relaxing day on Cape May Harbor is just a click away! Slips: Seasonal slips available from April 15th through October 15th. Extend your fishing fun with Striper Season slips available until November 15th. Winter Storage:We'll keep your boat safe and sound and get you ready for next season.